All in all we know very little about Australia’s very earliest Chinese residents. The earliest recorded arrival was a carpenter named Ahuto who came in 1803 on the Rolla (according to the 1825 General Muster List of NSW) – but no more is known about him. Best known is Mak Sai Ying, or John Shying, who arrived in Sydney as a free settler in 1818, working first as a carpenter with John Blaxland before establishing himself in business at Parramatta, marrying twice to white women and fathering four sons. Family history research papers about Shying and his descendents are held in Sydney’s Mitchell Library. Histories by Eric Rolls, Shirley Fitzgerald, Janis Wilton and Ian Jack have sketched the presence of a small number of other Chinese men who lived in Sydney at the same time as Shying—sailors, other carpenters, and labourers brought out on contract to work primarily in agriculture. 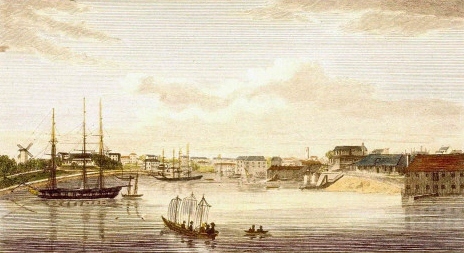 Sydney in 1820. Australian National Maritime Museum Collection 00000858. In the 1820s there is record of John Dunmore Lang—Sydney’s first Presbyterian minister who himself only arrived in 1823—employing Chinese carpenters named Queng and Tchiou in 1827, and of two Chinese men (a cook and a carpenter) being among the multicultural labour force employed by the Macarthurs at Elizabeth Farm at Parramatta. The NSW Colonial Secretary’s correspondence shows that three Chinese carpenters—Ahehew, Ahoun and Awage—requested to remain permanently in the colony before 1825. Another man, Achin, was admitted to the general hospital in 1824. And the 1828 census recorded Ahchun, Ahfoo and Ahlong in the employ of a T.G. Pitman in Sydney. The colonial shipping news also records the comings and goings of Chinese men—such as the arrival of an unnamed Chinese carpenter on the Nimrod in December 1827; the departure of Yan, Hang and Nee for Mauritius on the Bee in June 1832; and the arrival of four unnamed Chinese labourers on the Regia from Singapore in September 1838. In my PhD study of Chinese-European marriages in colonial New South Wales, John Shying’s two marriages were the only Chinese marriages I found before the early 1850s. But I now have evidence of at least two or three more (thanks to Trove). One of these was between a Chinese man named James Tame, a Catholic catechist converted by the Portuguese (presumably in or near Macau), and Englishwoman Mary Rapsey, who seems to have been an assigned convict at the time of their marriage in 1839. A family of ‘four Chinese children’ and their parents were reported as living at Goulburn in March 1842 (I’m pretty certain these would be mixed-race children, as I haven’t identified a Chinese mother in the colony before the 1860s). The other early mixed marriage I have come across involved a previously unknown contemporary of John Shying named Man Sue Bach. When he died in 1862, Man Sue Bach was 72 years old and had been living in New South Wales for 42 years, suggesting he had arrived in the colony in around 1820. On reporting his death, the Empire newspaper stated that Man Sue Bach was the ‘oldest Chinese colonist’, as he was considered the oldest member of the Chinese race in the colony and had been the longest resident. Being something of a curiosity, both the Empire and Sydney Morning Herald reported on Man Sue Bach’s passing in some detail, and their reports were reprinted in papers such as the Maitland Mercury and Launceston’s Cornwall Chronicle. My account of Man Sue Bach’s life and death is based on these press accounts and on the details provided on his death certificates. I haven’t been able to locate other records, but that’s not to say he won’t pop up somewhere else—versions of his name I’ve found are Man Sue Bach, Mum Shou Pac, John Ah Shue Bach, John A. Sue Bach, John Ah Sue and John a Shue. There may well be formal records of his baptism, his marriage and the birth of his children, but I haven’t yet managed to track them down. Man Sue Bach was born around 1790 and he was said to have been a ‘native of Hongkong’. Although he could have been born in Hong Kong itself, it is equally possible that his native place was inland from Hong Kong in Guangdong province, as his birth and later departure for overseas ports took place well before the ceding of Hong Kong to the British in 1842 after the first Opium War. He arrived in Sydney around 1820 from Saint Helena, the tiny British outpost in the mid-Atlantic most famous as Napoleon Bonaparte’s place of exile. Controlled by the British East India Company, Saint Helena was an important stop on the sea route between Britain and India, where ships restocked with supplies, and the majority of its population were African slaves. After Britain abolished the Atlantic slave trade, however, the East India Company looked to China to provide a source of labour. From 1810 Chinese workers began arriving on the island, with the population peaking at over 600 men in 1817. Most worked as agricultural labourers and were indentured for contracts of three to five years. After he arrived in New South Wales, Man Sue Bach travelled inland and eventually settled in the New England region, where he was said to have married and had a family of at least two sons. He also converted to Catholicism. In more recent years he had moved to Sydney where he kept a lodging house on Lower George Street, which was then the city’s fledgling Chinatown. He also made the arrangements for provisioning of ships leaving for China. Between these two enterprises he supported himself, even at his advanced age. The press accounts contain no more detail about his earlier life in the colony. Man Sue Bach died on 4 June 1862, at about half past nine in the evening. He had been lying on his bed in his home at 169 Lower George Street when, at about 8.30 pm, he started and cried out in Chinese that he was dying. Dr Wright of Hunter Street was called for, but Man Sue Bach died soon after his arrival. When the news of his death spread, the Chinese storekeepers in Lower George Street and other parts of the city closed their shops in mourning. In the press reports there is no mention of Man Sue Bach’s wife being present, so it seems probable that she had predeceased him and perhaps even that he had little contact with his adult sons. No details about a marriage or children were given when his death was registered, suggesting that the details were not known to those around him, although the press reported that his sons were still in New England and he had a brother at Lambing Flat. The Sydney Morning Herald said that Man Sue Bach had been a ‘valued counsellor and friend’ to his countrymen in Sydney and, according to the Empire, they called him by the name ‘Governor’. Having lived in the colony for more than forty years, Man Sue Bach spoke English perfectly and understood how colonial life worked, meaning that many Chinese had sought his advice on ‘their personal welfare or business undertakings’. He also helped them financially, being ‘very ready … to assist them with loans of small sums of money when in distress’. He was honoured and respected by his fellow Chinese colonists, too, because of his old age, and the Empire declared that he would be ‘much missed’. A notice of Man Sue Bach’s death was published in the Sydney Morning Herald on 5 June (and reprinted on 21 June), and the City Coroner held an inquest at the Prince of Wales Hotel in George Street North the following day. Although he had enjoyed good health during his long life, during the previous few months Man Sue Bach had been ailing, complaining of a pain in the back. Based on the diagnosis of Dr Wright, who attended Man Sue Bach in his last minutes, the coroner found that death was due to an apoplectic fit. Man Sue Bach was buried in the Roman Catholic cemetery. The funeral cortege that left from his Lower George Street home at 3 o’clock on the afternoon of Friday, 6 June, comprised ‘a long string of carriages’, numbering forty-one in total and including four mourning coaches. The funeral was attended by many Chinese, but also by white ‘diggers and others’, who, the Empire noted, ‘seemed to participate in their regret’. The death was registered twice, first by the coroner on 30 June 1862 and then, on 30 August 1862, by the undertaker, Eliza Hanslow. Witnesses to his burial were Thomas Hanslow and John Shying (son of our original John Shying), who was a foreman with the Hanslow family’s firm of undertakers. Several years later John Shying junior set up business as an undertaker with his brother George in George Street South. Alan Dougan, ‘McIntyre, William (1805–1870)’, Australian Dictionary of Biography, National Centre of Biography, Australian National University, <adb.anu.edu.au/biography/mcintyre-william-4103/text6557>, accessed 11 February 2013. DWA Baker, ‘Lang, John Dunmore (1799–1878)’, Australian Dictionary of Biography, National Centre of Biography, Australian National University, <adb.anu.edu.au/biography/lang-john-dunmore-2326/text2953>, accessed 11 February 2013. Eric Rolls, Sojourners: The Epic Story of China’s Centuries-old Relationship with Australia – Flowers and the Wide Sea, University of Queensland Press, St Lucia, 1992. Index to the Colonial Secretary’s Papers, 1788–1825, State Records New South Wales, <www.records.nsw.gov.au/state-archives/indexes-online/colonial-secretary/index-to-the-colonial-secretarys-papers-1788-1825>. Janis Wilton, Golden Threads: The Chinese in Regional New South Wales, 1850–1950, New England Regional Art Museum in association with Powerhouse Publishing, Armidale, 2004. Li Anshan, A History of the Overseas Chinese in Africa to 1911, Diasporic Africa Press, New York, 2012. NSW death registration for John a Shue, 1862/680. NSW death registration for Man Sue Bach, 1862/895. NSW marriage registration for James Jim and Mary Rapley, V1839526 73A/1839 (Presbyterian, Scots Church, Sydney). Saint Helena National Trust, ‘Some notes on the Chinese connection’, Newsletter, no. 16, August 2007, <www.nationaltrust.org.sh/newsletters/no16/newsletter-16-aug07-4.html>. Shirley Fitzgerald, Red Tape, Gold Scissors: The Story of Sydney’s Chinese, State Library of New South Wales Press, Sydney, 1997. Winsome Doyle, ‘Research papers relating to John Shying, a Chinese settler in New South Wales (believed to have arrived in New South Wales in 1818), and his descendants, 198-?-ca. 1992’, MLMSS 5857, State Library of New South Wales. 1915 ‘Died at 117’, Singleton Argus, 7 December, p. 1, viewed 11 February 2013, <nla.gov.au/nla.news-article80175666>. 1865 ‘Family notices’, Empire, 11 April, p. 8, viewed 7 February 2013, <nla.gov.au/nla.news-article60569201>. 1862 ‘New South Wales’, Cornwall Chronicle, 5 July, p. 2, viewed 12 February 2013, <nla.gov.au/nla.news-article65570088>. 1862 ‘Deaths’, Sydney Morning Herald, 21 June, p. 7, viewed 8 February 2013, <nla.gov.au/nla.news-article13230520>. 1862 ‘Funeral of the oldest Chinese colonist’, Maitland Mercury and Hunter River General Advertiser, 12 June, p. 3, <nla.gov.au/nla.news-article18688858>. 1862 ‘Funeral of an old Chinese resident’, Sydney Morning Herald, 9 June, p. 4, viewed 8 February 2013, <nla.gov.au/nla.news-article13229897>. 1862 ‘Coroner’s inquest’ and ‘Funeral of the oldest Chinese colonist’, Empire, 7 June, p. 5, viewed 11 February 2013, <nla.gov.au/nla.news-article60476514>. 1862 ‘Deaths’, Sydney Morning Herald, 5 June, p. 1, viewed 8 February 2013, <nla.gov.au/nla.news-article13229695>. 1842 ‘Goulburn’, Sydney Herald, 26 March, p. 3, viewed 11 February 2013, <nla.gov.au/nla.news-article12874371>. 1839 ‘Conversion and perversion’, The Australian, 24 September, p. 2, viewed 11 February 2013, <nla.gov.au/nla.news-article36861109>. 1839 ‘News of the day’, Sydney Monitor and Commercial Advertiser, 27 September, p. 2 Edition: MORNING, viewed 11 February 2013, <nla.gov.au/nla.news-article32165693>. 1838 ‘Shipping intelligence’, Sydney Gazette and New South Wales Advertiser, 15 September, p. 2, viewed 11 February 2013, <nla.gov.au/nla.news-article2551308>. 1832 ‘Shipping intelligence’, Sydney Herald, 4 June, p. 2, viewed 11 February 2013, <nla.gov.au/nla.news-article12844633>. 1827 ‘Shipping intelligence’, Sydney Gazette and New South Wales Advertiser, 31 December, p. 2, viewed 11 February 2013, <nla.gov.au/nla.news-article2189676>. It is a great article and you write so clearly. Currently struggling with that. I didn’t see a reference in your bibliography for Ian Jack’s information on Ah Nee, employee of Andrew Brown. Would you have one?. If not, i could ask Ian Jack myself. Janis Wilton refers to Ian Jack’s work on Ah Nee in her Golden Threads book referenced above. The original work Janis cites is Ian’s chapter, ‘Some less familiar aspects of the Chinese in 19th-century Australia’ in Chan, Curthoys and Chiang (ads), The Overseas Chinese in Australasia: History, Settlement and Interactions (Taipei, 2001). Very interested in Man Sue Bach and his missing sons. Don’t forget my John Mann, Confectioner at Parramatta, New South Wales. He died on 15 January 1855 at Parramatta, according to his burial index, and cemetery records, aged 38 years. Birth year estimated as c. 1817. John Mann and Ellen Lyons’ marriage entry at St. John’s Church of England at Parramatta is indexed in the name of John Menn. 10 Oct 1842, #370; Vol 26C – very next entry after John Shying’s second marriage to Bridget Gillorley on the same day. John Shying signed in Chinese characters but John Mann/Menn’s signature appears to be in the same hand as Rev. H. Bobart, John Mann’s second marriage to Betsy Kerigan signed with an “X.” (1853 – Scots Church, Parramatta). The four Mann girls were technically orphaned by January 1855, with their mother predeceased in January 1853. They had a stepmother, but no archival records have surfaced for her as yet. (Betsy Kerigan). Purchased about three marriage records, but not the same Elizabeth Mann. John Mann’s four daughters, Mary, Emma, Rosina and Ellen Ann Mann all married significant Chinese merchants. Who arranged these girls’ marriages? Who reared these girls after their father’s death, who arranged for Mary and Rosa to travel to Melbourne to live in the household of Lowe Kong Meng and Ping Kee? Mary Mann married Lowe Peng Ip in St. Kilda, Victoria; VIC 1864/4322r, where Mary listed her father as Fung Mann. (not John Mann). Family notice for Mary Mann’s death, (probably placed by her sister Rosa Mann) also state Mary as the daughter of the late Foong Mann, of Parramatta. Rosina Mary Mann married Chun Hoo Ley Kum in Melbourne, 17 Sept 1874, by Chinese Ceremony. Family Notice in The Argus, states the marriage was by Chinese ceremony, Notice listed Rosina (Rosa) Mann as being the daughter of the late Fong Mann of Parramatta. Ellen Ann Mann married Kong Sing, known as Lee Kong Sing, storekeeper at Nundle, then Tamworth, followed by Tingha. Possibly Yee Kong Sing. NSW marriage 1866/623 (at The Rocks, Sydney). Variations for John Mann are John Menn, Fong Mann, Foong Mann, Fung Mann. Was he born in the colony, was he of Chinese heritage? Could a servant of Chinese heritage learn the trade of a fine confectioner, catering to grand balls? No archival records for the arrival of John Mann in any name have been uncovered yet. But that is not surprising. I am interestedt to learn more of Man Sue Bach, especially the Lower George Street connection with his death in 1862, just four months after Emma Mann married Yung Sing, a Chinese merchant at Lower George Street. Kate, would you understand Man Sue Bach’s family name to be Man? On pre-1850s marriages: A friend of mine became interested in genealogy and came across a Chinese ancestor called John Young (aka Yung) who worked for the Australian Steam and Navigation Company during the 1840s, and married the daughter of the ASNC manager in Moreton Bay. Still part of NSW at that time. I’m afraid I don’t have any further details, or how she managed to prove that someone with such an ostensibly Anglo name was Chinese. Thanks Marion, that’s very interesting. I think the main part of my problem with locating very early mixed marriages has been the names. It seems that quite a number of the earliest arrivals were baptised and then took on Christian/English names, meaning that they don’t appear obviously as Chinese in many of the records.